Robert Yardy, 64, is from Yorkshire. He’s owned nine bikes.
" The first bike I had was one of these 50cc things, while I was still learning, " recalls Robert Yardy. " It was a custom-built frame with some kind of engine unit on the back that rubbed on the back tyre. I can’t remember the name of it. I did a 100-mile journey from my home in Rotherham to relatives in North Yorkshire and I remember having to push it up Sutton Bank (a notorious ‘cliff’ with a road winding up it). I can’t tell you how long the trip took, but I remember my arse turned to jelly on the way there. I was never embarrassed by the bike. When it’s your first bike you’re happy to have anything. I was happy to move on from it though. It was the cheapest bike I owned, because my father bought it but he was scared to death of it, so I rode it.
" My first proper motorbike was a brand new 1956 Triumph Tiger Cub I bought when I was 18. It cost £120 but I was on less than £5 a week. I got impoverished and traded down to my next bike that was a BSA 500. I can’t remember the year of it, but it had a rigid back end and it nearly killed me. I was in Rotherham once and as I was pulling up at some traffic lights I put the brake on. The next thing I knew my face hit the ground and I ended up with my head about a foot from the radiator of a Sheffield double-decker. That bike was a disaster from the beginning. It was bloody uncomfortable and a bugger to service. It was a big mistake. I didn’t have it too long, I bought a car instead. You know you get married, buy a house and all that, so I ended up with a 1934 Wolsey Hornet, " says Robert describing the almost inevitable progression from car to bikes of the family man of the Fifties and Sixties. Or those that could afford cars, anyway.
" Eventually I decided motorbikes were cheaper so I bought a 350cc Norton Model 50 in 1962. I had the Norton a long time. Blew the big ends out of it and went all over the place. That was my favourite bike. The thing is I was poor, you had to ride a bike because you couldn’t afford a car and I went all over the place. Up the east coast of Scotland level with Inverness, all two-up. " After the Norton Robert drifted out of biking until he bought a Kawasaki 200 single in 1978. " I persuaded myself I’d bought it for commuting on, " he says obviously grasping at excuses to buy another bike. After the Kawasaki there was another gap until he found himself working in Saudi Arabia in 1996.
" There was an American who had a motorbike and he’d been a naughty boy and was being sent home in two weeks so he had to get rid of it quick. It was a 1993 Honda Shadow. I didn’t like the cruiser styling, but it had only done 680 miles and it had sat in his air-conditioned garage for three years. I got it for £2000 which I thought was pretty good. That set me off again, but the experience of riding in 40-plus centigrade temperatures for two hours is not fun. You can’t wear anything because it’s so hot. So, if you fall on the road and can’t get up, you’d cook before they’d find you.
" I was going to bring the Shadow back to England, because I was going to retire here, but I ended up living in Jordan. For security reasons you can only ride a bike in Jordan if you’re police or military or a courier with a company. " 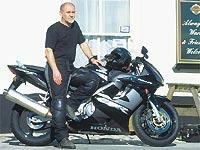 With the Shadow gone and Robert spending his time between Europe and the Middle East the hunt was on for another bike.
" In May 98, when I was 61, I bought a Honda Deauville. I figured I was going to be touring and the shaft-drive meant I didn’t have to prat about with the chain all the time which is a ball-ache. It seemed a good reliable thing for plodding around. The idea was I’d leave Jordan during the hot summer and get lost in Europe. The Deauville was fine. I did about 12,500 miles on that, but one day I was in Basle in Switzerland and I had to stop in a garage a bit quick, it was heavy and not terribly good at slow speeds and I dropped it. So I started looking for something lighter. I went to a Suzuki dealer looking for an SV650, but the dealer was an idiot, so I ended up back at the Honda agent. He pulled out a ’98 CBR600. I played with it at the showroom and I knew the reputation of it and I got a good deal.
" I got the CBR simply because I wanted something lighter, I didn’t need the extra power. The difference between them is one is an axe, the other’s a scalpel. The weird thing is I’ve ended up feeling more comfortable over long distances on the CBR rather than the Deauville which gave me all sorts of aches and pains.
" My philosophy of bikes is I want something that’s not noisy, that’s not noticeable, but it’s fast as hell so when I go by maybe you saw me, maybe you didn’t and perhaps you’ll forget quick. The CBR’s fine, but I’m not sure if I’m going to keep it or buy something smaller and lighter and a bit off-road so I can just mess about. I’ve never done any off-road before, but I’m nearly 65 and I need a lighter bike you know. "